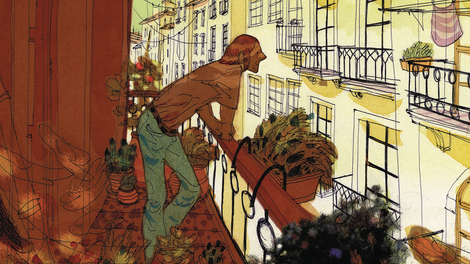 The story of Cyril Pedrosa’s Portugal is a familiar one: An adult artist is experiencing a creative block, and needs to reconnect with his roots in order to revitalize his passion, not just for his work, but for his life. In the hands of Pedrosa, familiarity is a gateway to universality, and this graphic novel will resonate with anyone who has felt professionally and personally lost and yearned to discover where they came from to understand how the past informs the present. 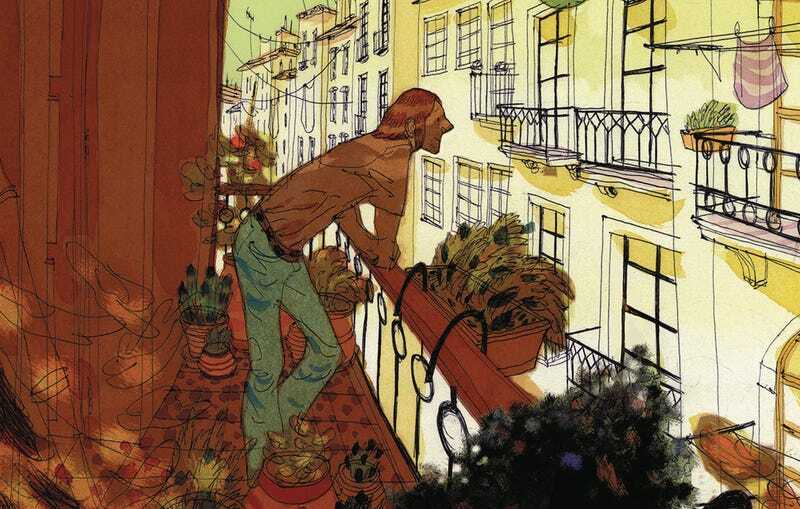 Cartoonist Simon Muchat is stuck in a downward spiral, uninterested in working on a new book and unable to connect with his significant other, but a trip to his family’s home country of Portugal provides a much-needed reset by giving him something new to focus on. Simon becomes fixated on learning more about his grandfather, who emigrated to France to escape Portugal’s authoritarian Estado Novo regime in early 1930s, and that fixation brings him closer to family members he hasn’t seen in years as he searches for new information. Pedrosa brings a lot of warmth to Simon’s interactions with relatives who are thrilled to see how much he’s changed over time, but he doesn’t shy away from the tension that inevitably develops within a family unit. This is especially clear in the dynamic between Simon’s father, his aunt, and his uncle, three siblings who know exactly what buttons to push to ruin pleasant moments. Nearly every relationship in this book contains some kind of hardship, and it helps Simon put his own problems in perspective. Pedrosa has a background in animation, having worked on Disney films like The Hunchback Of Notre Dame and Hercules, and you can see the influence of that experience in the vitality of his artwork, specifically the characterizations. There’s so much life in these figures, and even when the dialogue is in untranslated Portuguese, it’s easy to glean intent from facial expressions and body language. Group scenes are especially energetic, and shots of people eating dinner at a long table or dancing at a bar have an effervescent quality that refreshes Simon’s spirit. Most of the artwork is drawn with a fine-tipped pen and then painted, and Pedrosa uses a rushed, sketchy line to give the visuals a spontaneous quality. Rushed does not mean sloppy, though, and there’s remarkable precision in the artwork, with each location and character rendered in lush detail. Much of Simon’s story is defined by isolation, but the nature of his solitude changes over the course of the graphic novel. He’s lonely at the start, emotionally distanced from the world around him and adrift in his increasingly aimless, depressed thoughts. But as he situates himself in Portugal and rebuilds relationships with this family, he’s surrounded by an air of contended calm when he’s alone. Digging into the past shows him how to move forward, and Pedrosa turns Simon’s self-discovery into a beautiful journey through a foreign country full of wonders.